By conforming to EU Regulation No. 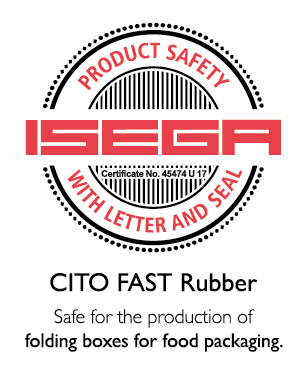 1935/2004 for food contact materials, Articles 3 and 17, CITO FAST Rubber is safe for the production of folding cartons for food packaging. This cost-effective version is also good for use with corrugated board to prevent fluting around the edge of the tuck-in flaps from being crushed.